Following a college career in which he was a consensus first-team All-American and Atlantic Coast Conference Player of the Year for 1980, Taylor was chosen in the first round by the Giants in 1981 (second overall). It was expected that he would start right away, and he did with an immediate impact. Giants went 9-7 to finish third in the NFC East while qualifying for the postseason as a Wild Card – the franchise’s first postseason appearance since 1963. Won NFC Wild Card playoff over Philadelphia Eagles (27-21). Lost NFC Divisional playoff to San Francisco 49ers (38-24). With his attacking style of play, Taylor almost immediately set new standards for outside linebackers and was a consensus first-team All-Pro and Pro Bowl selection in each of his first six seasons and NFL Defensive Player of the Year again in 1982. In 1986 he received consensus MVP honors and was the AP Defensive Player of the Year for a third time following a season in which Taylor recorded 20.5 sacks and the Giants won the Super Bowl. Taylor continued to be the leader of the Giants defense, achieving consensus first-team All Pro honors twice more and being selected to four more Pro Bowls (for a total of 10 consecutive, going back to his rookie year). 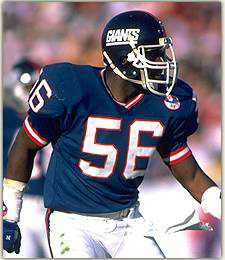 He retired following the 1993 season, with 132.5 career sacks, and his #56 was retired by the Giants. Taylor was inducted into the Pro Football Hall of Fame, Class of 1999.